It's usually easier to deal with the DOE than private lenders when seeking a negoiated settlement. 3. How Quickly Can I Get a Mortgage Loan Audit? The U.S. Department of Education has a tough time collecting student loan debt when the economy is good. When the nation’s financial picture is less than idyllic, things get worse — for you, too. The job you assumed would be waiting after graduation is nowhere in sight and the funds you borrowed to get that degree may have increased, thanks to interest and penalties. These days, savvy students are turning to settlement strategies to retire their debt. Expect to be put through hoops, particularly if your creditor isn’t associated with the DOE. Private lenders are not subject to the same regulations as DOE-affiliated lenders, usually operate on commission and try to extract as much outstanding debt as possible. Some claim they have no authority to negotiate. In all settlement-seeking situations, you must prove to the lender that “the interest and collection fees have grown so rapidly ... it will be impossible to pay it back,” adds Phillip Cervin, vice president of collections for the Texas Guaranteed Student Loan Corp. Check your lender’s math to confirm that you owe the amount posted on your student loan tab. Collection agencies make mistakes all the time. Students can find incorrect interest postings, errors in fund transcriptions, status changes and collection charges pinned to their loan balance that have no relationship to the debt they owe. “When there are errors, they will typically represent 5 percent to 20 percent of the outstanding debt,” according to FinAid.org. Offer to borrow a set amount of cash to retire your entire loan if the lender is willing to reduce a portion of the balance as a negotiated settlement. If the lender counter-offers, you could wind up with a compromise. Whatever the outcome of the negotiation, have an attorney vet the details. Collection agencies have been known to use cash intended to settle a student loan to reduce the balance rather than obliterate the note. Evaluate the three private collection agency settlement options accepted by the DOE to see if one fits your circumstances. Your options are: paying the principle balance and interest, but waiving collection charges; paying off the principle balance plus half of the accrued (unpaid) interest; or paying at least 90 percent of the principle and interest. All are available to you if you don’t want to continue fighting the obligation. Set your own negotiation rules, suggests Jennifer Saranow Schultz, writing for "The New York Times." Begin the process by asking for a “collection charges waiver” first. This advice, from expert Mark Kantrowitz of FinAid.org, is based on debt settlement procedures published by the DOE. Getting this waiver, which averages 25 percent of every post-default payment missed, returns you to your former obligation consisting of principle and interest only, without collection charges. Request an income-based repayment plan, available to students with government loans. This obligation is typically 10 percent (15 percent after July 1, 2014) of your gross income. “Students can rehabilitate loans already in default by making 10 consecutive on-time payments; then they can switch to income-based repayment,” according to the DOE. Private lenders aren’t usually as generous. 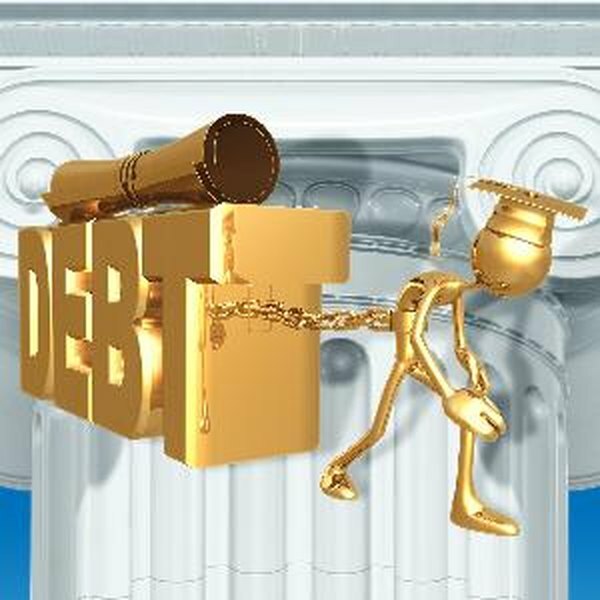 “You can offer them a repayment plan or settlement offer and hope that they take it, but that's it," says Anya Kamenetz, author of "Generation Debt: Why Now Is a Terrible Time To Be Young." Seek help. If every effort you make to pay off your student loan is rejected, or if you feel you are the victim of predatory, abusive, deceptive or unfair collection practices in violation of the Fair Debt Collection Practices Act, call the DOE Default Resolution Group at 1-800-621-3115. An ombudsman program can assign a representative to help you settle your loan. Learn more about this option at 1-877-557-2575. Pay your taxes. Once your offer to retire your student loan has been accepted, ask your lender or tax professional about tax implications. Expect to be taxed on the amount that’s been forgiven by the lender. This can have a big impact on your financial situation if you are in a high tax bracket, so prepare for this eventuality early so no surprises await you when you file your tax return. Negotiate with confidence in this sluggish economic climate. Debtors want your student loan off their books. Borrow money to liquidate your student loan debt only if you are sure you can pay it back in a timely manner.